Regarded by some as the spiritual successor to El Bulli in Spain, Mugaritz has garnered both acclaim and criticism in some measure in recent years for its bold and experimental cuisine fusing not just taste and texture, but sight, sound and touch as well, attempting to create a full sensory experience for the diners. 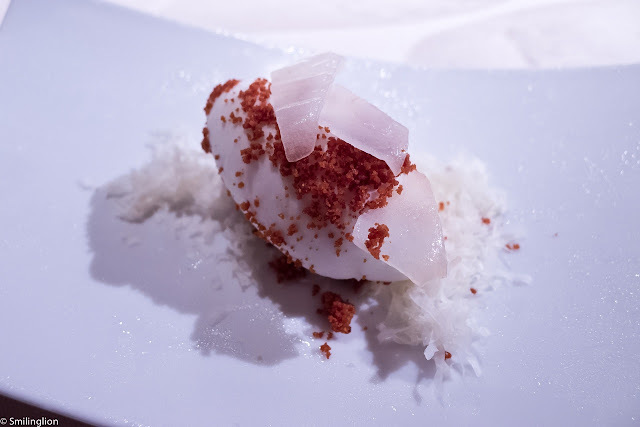 A holder of 2 Michelin stars and voted 3rd in the San Pellegrino The World's 50 Best Restaurant's list in 2012, foodies travel from all over the world to eat at this renowned restaurant. Nestled in the green and lush Basque countryside about 45 minutes drive from the centre of San Sebastian, the Mugaritz dining room appeared quite vast and open but each table was well spaced and the clever use of white sheets to demarcate spaces created a rather cozy dining environment. 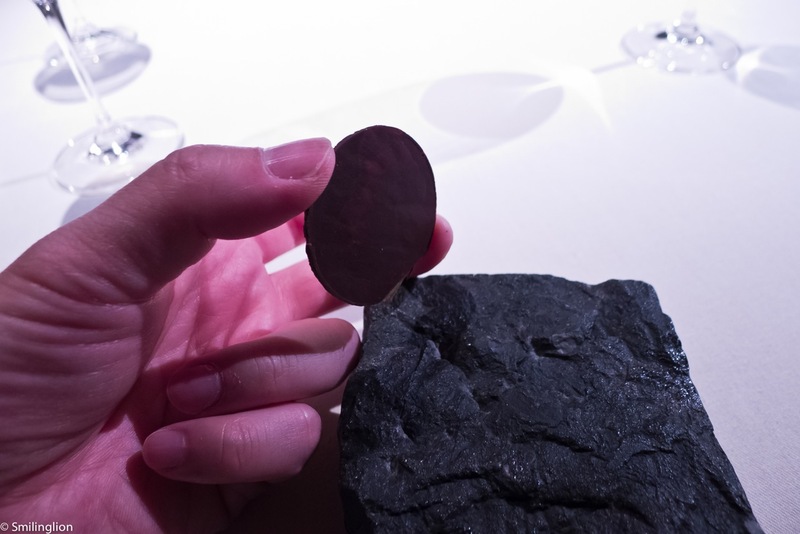 At Mugaritz, there was only one tasting menu which documented a 3-4 hour long culinary experience incorporating a variety of sensory experiences. 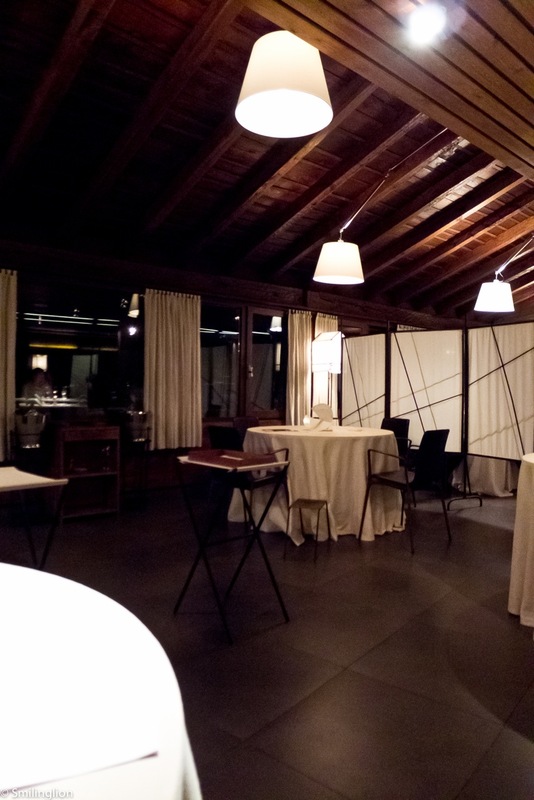 We enjoyed the warm and friendly service and were able to settle in comfortably for a long meal. "Satiation eludes bread and olives..": Dinner commenced with a bit of fun. 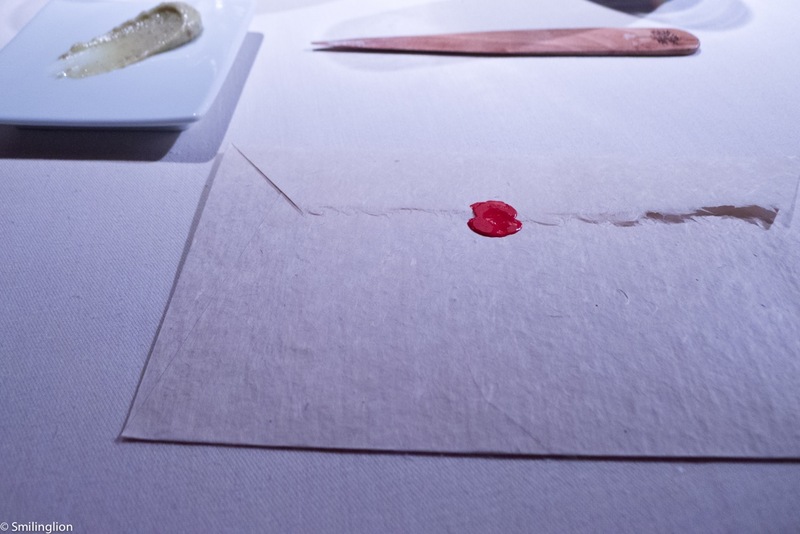 We were asked to open an envelope to retrieve a piece of 'paper', after which we ate the 'paper' with an olive spread. It was no culinary wonder but gave us a hint of what was to come. 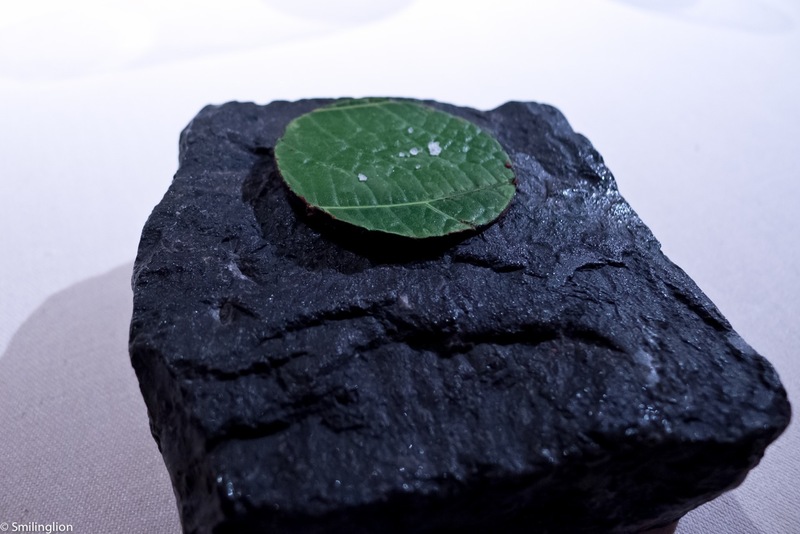 Edible stones: This was gorgeous. 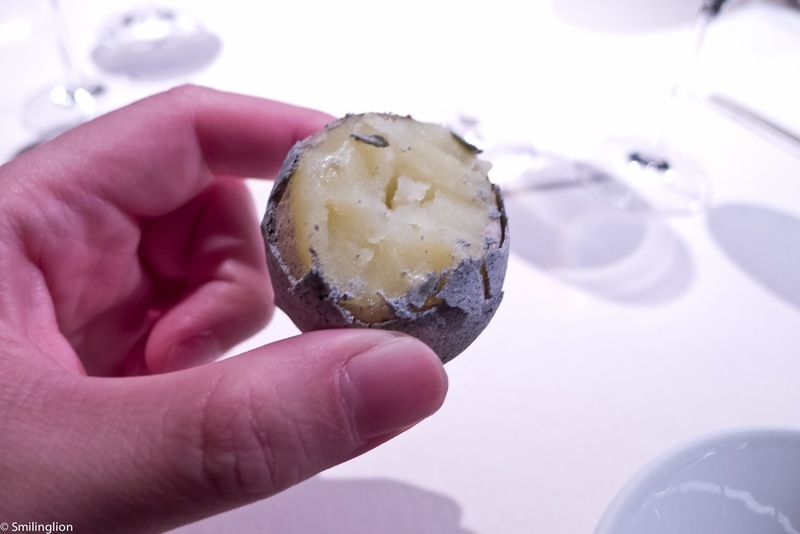 It was amazing how they made the baked potato look like granite stones on a bed of edible granite sand. 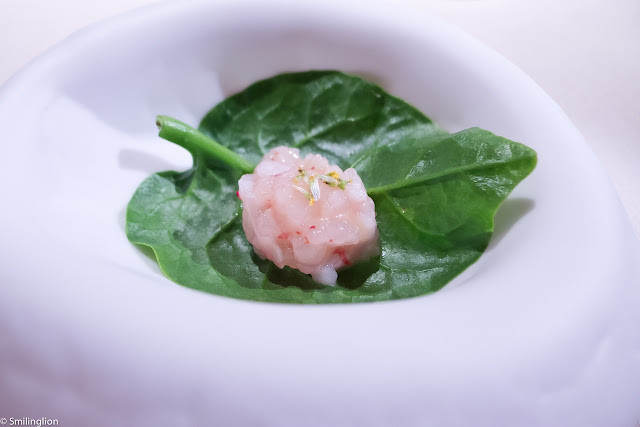 Scarlett shrimp over sake leaves: A subtle dish showing off the flavours of the sake leaf. 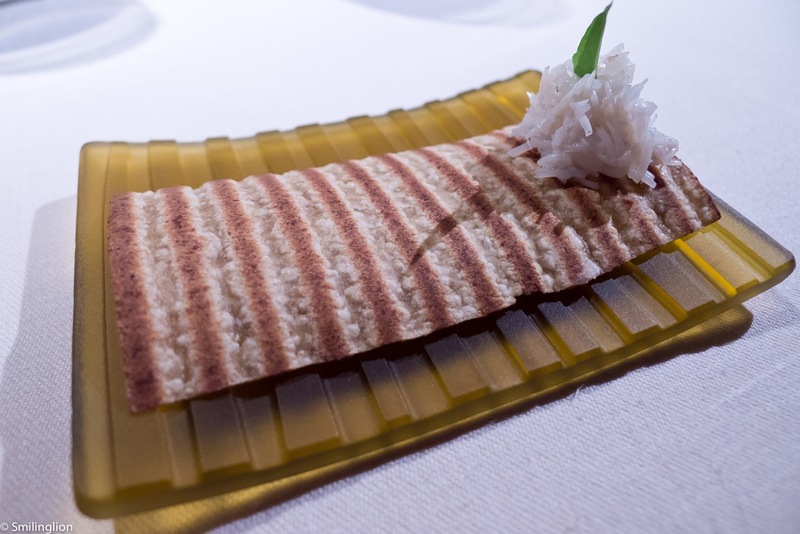 Flax and wheat "Kraft" paper with marine accents: This was a cracker which was not very noteworthy. 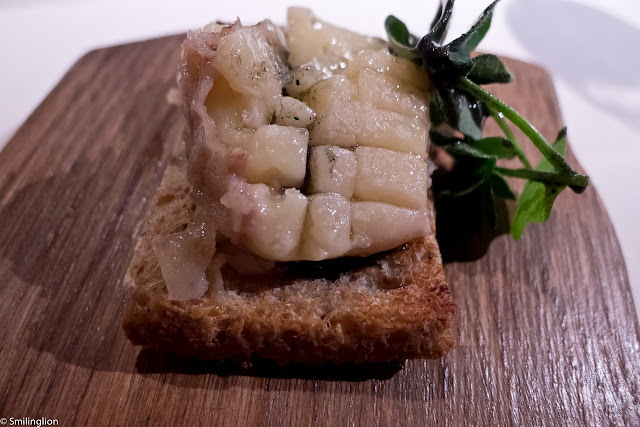 Grilled toast of bone marrow with herbs and horseradish ash: A classic which was both sinful and very tasty. 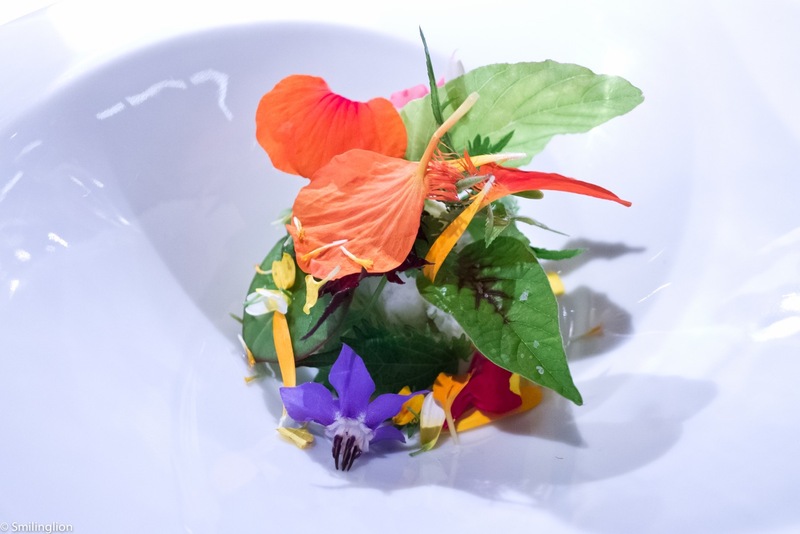 A sequence of wild and cultivated herbs with pickled vegetables and creamy dressing: A gorgeous looking dish which tasted just as good. Tagliatelle of concentrated milk lightly soaked in a silky juice of roasted squash and tomato: A strange dish whereby the pasta tasted like it wasn't even cooked (it was hard and stringy). 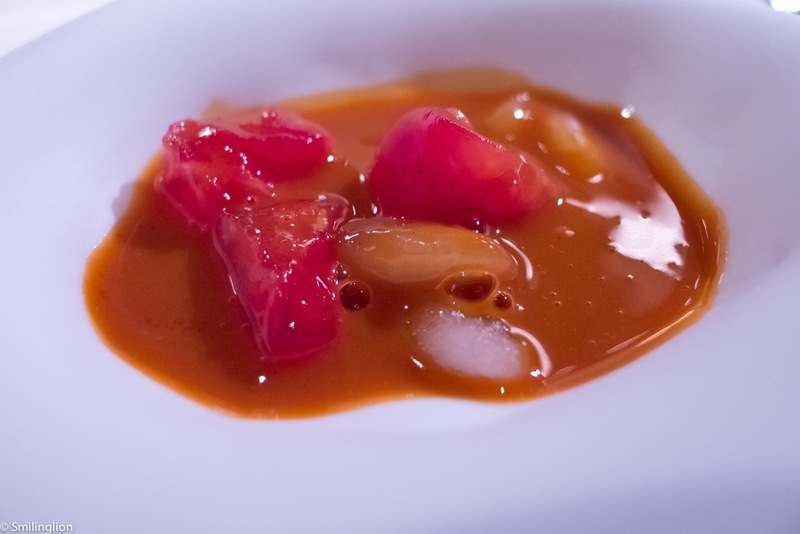 The sauce was good though, but otherwise we thought this dish was rather bizarre. "Bonding..." Toasted seeds and spices served in a mortar and vegetable broth: The most controversial course was the one which required each guest in the entire dining room to pound on the pestle given to him/her. This was coordinated properly so that this particular activity could occur regardless of which course each table was at. 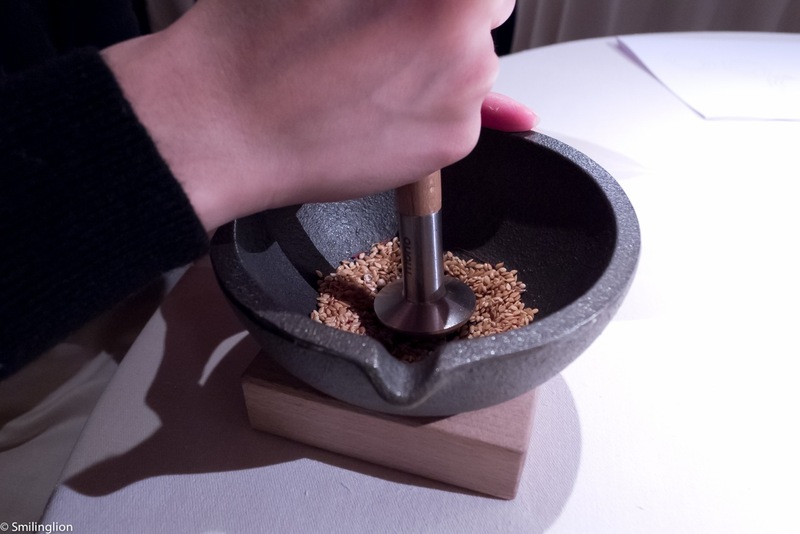 In the pestle was sesame seeds which the diner had to pound to a paste, after which the waiter would pour a broth in the paste and add a piece of poached cod. The activity was supposed to generate a common pounding sound in the dining room (creating the 'sound' experience). 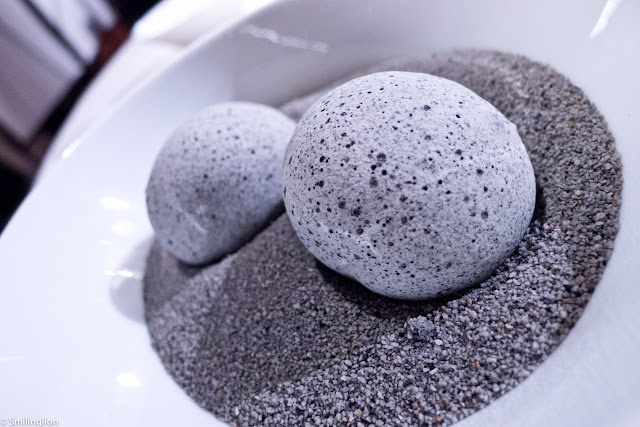 Unfortunately, the finished product was close to being inedible, which was probably understandable given that few diners bothered to properly pound the sesame. 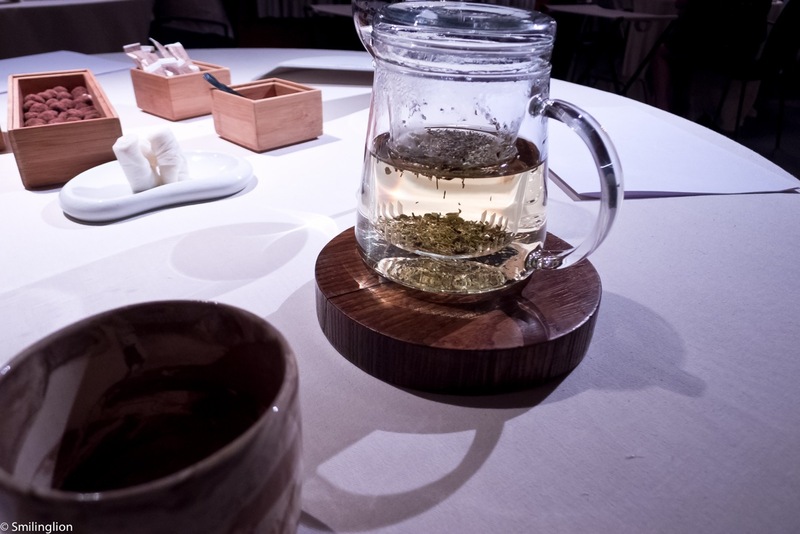 Nonetheless, it was a break in the monotony of eating and created a buzz of energy and awareness amongst the diners. Scarlet prawns, fresh pasta and tomato: This was delicious, rescuing the meal after the less-than-impressive efforts of the past two courses. 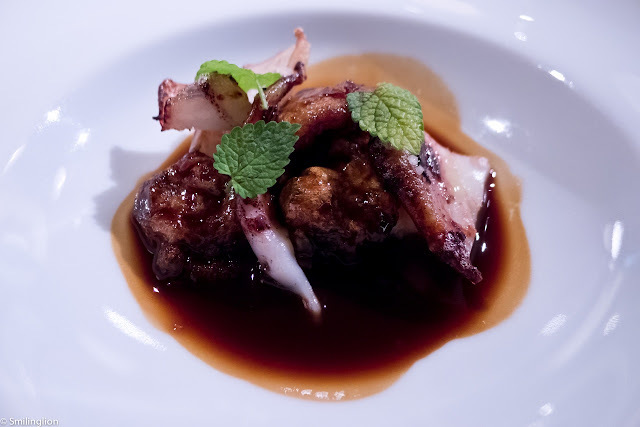 Stew of lemon rinds and grilled squid: The grilled squid with its tangy sauce was excellent. 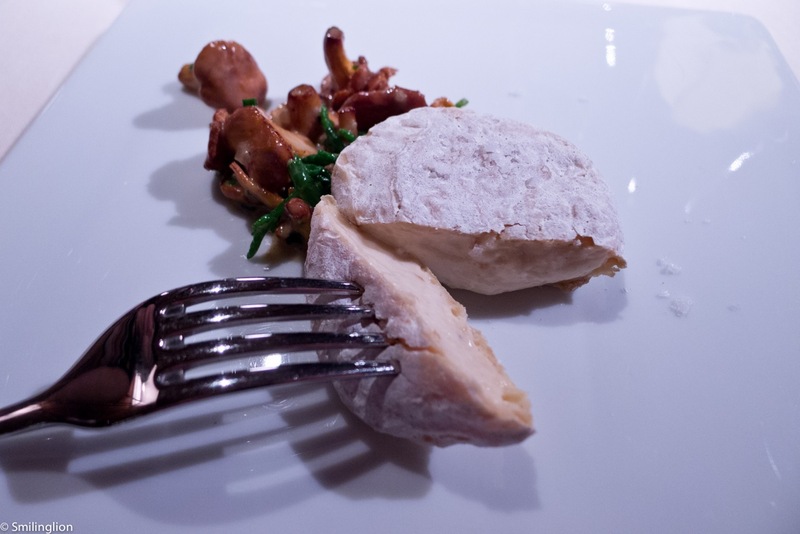 Portion of home-made cheese, cured in its own rind, mushrooms and fleshy leaves: Unusually, the cheese course in this case came halfway through the meal. 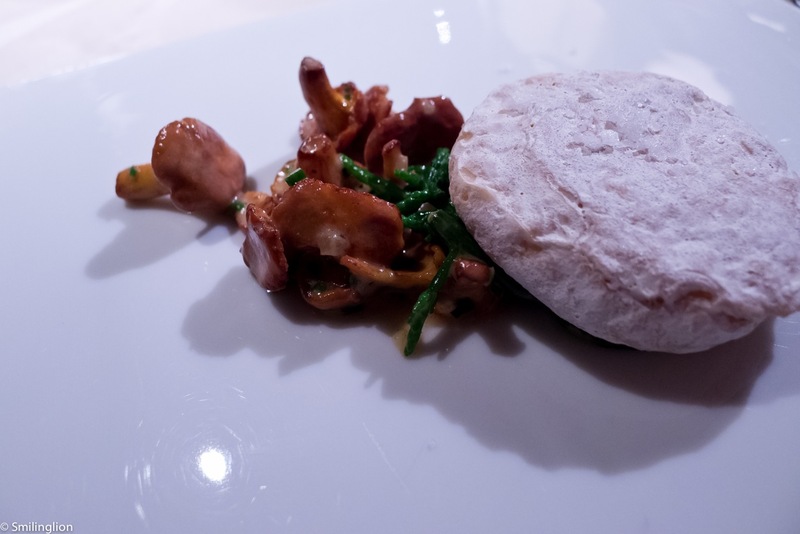 It was an interesting pairing of the sautéed mushrooms with the mild cheese. We quite enjoyed this. 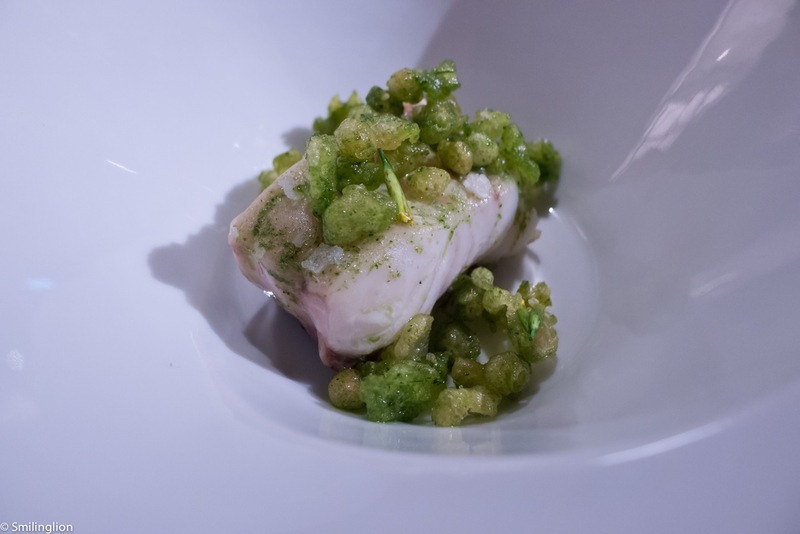 Coastal fish stained with trimmings of aged sourdough, parsley and Huacatay: Great dish. The sourdough was crunchy like a rice crispy. 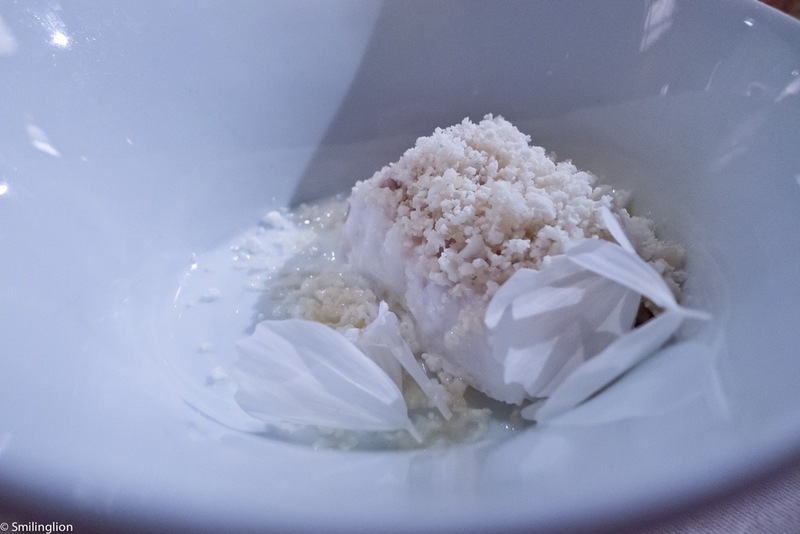 Roasted loin of hake with clashing grains of aged mascarpone, cauliflower and fresh almonds: Another well balanced and perfectly executed fish dish. 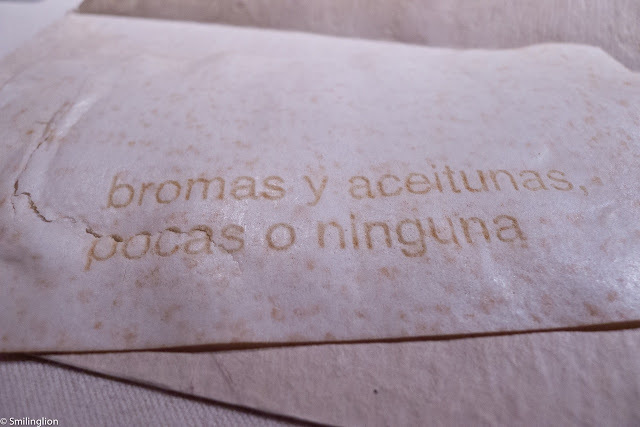 Sheets of "entrecula", grilled steak emulsion and salt crystals: As simple as a dish in Mugaritz could ever be, yet the best; the steak was the most amazing piece of beef we had in Spain. 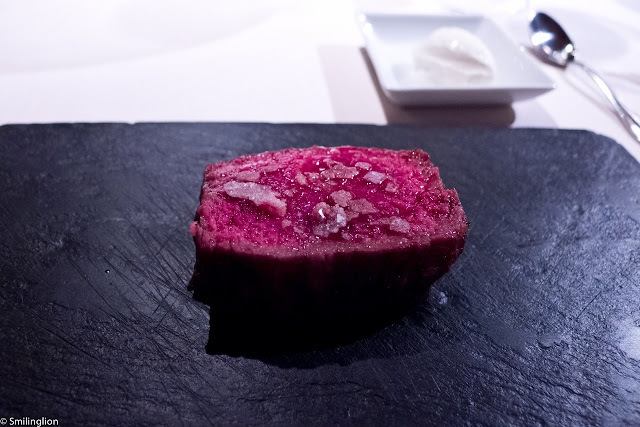 It was incredibly tasty and tender and yet lean. 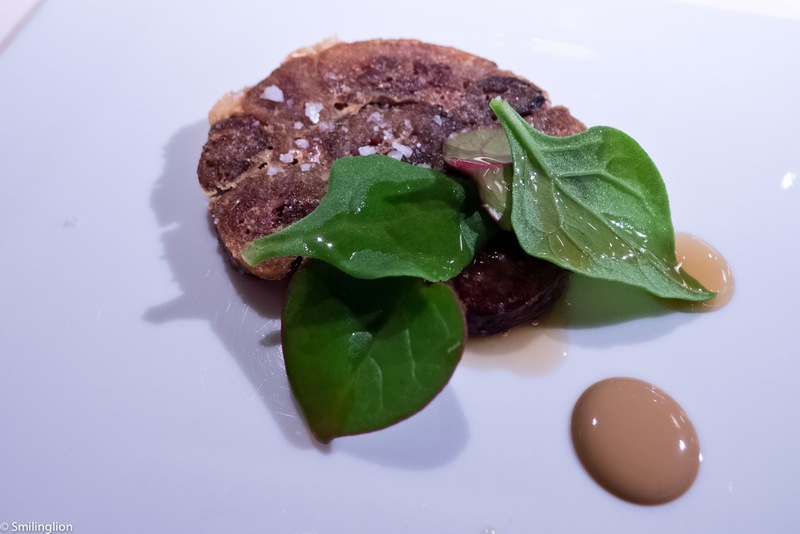 Crunchy terrine of Iberian pig tails with a bunch of bitter leaves and Txakoli sediments: After the beef, this was always going to pale in comparison, but despite that, it was very good. At this point, we were then invited to the kitchen to meet the chefs, and were served a very interesting pig's blood macaroon (no picture unfortunately) and introduced to a young Singaporean chef working there (she looked petrified to be honest, it was clear she'd much prefer to go back to her fish station). We were told that Mugaritz gets a fair number of Singapore guests, which is kind of mind-boggling given how far away it is and how few of us there are. 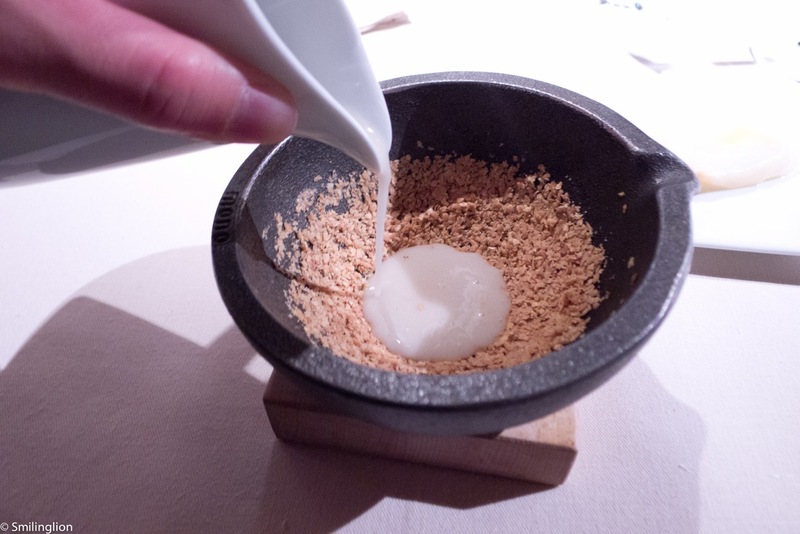 Toasted milk and butter with cheese shavings and frozen pear cream: A variation of a local milk dessert, the use of the pear sorbet matched with the milk and cheese was inspired. 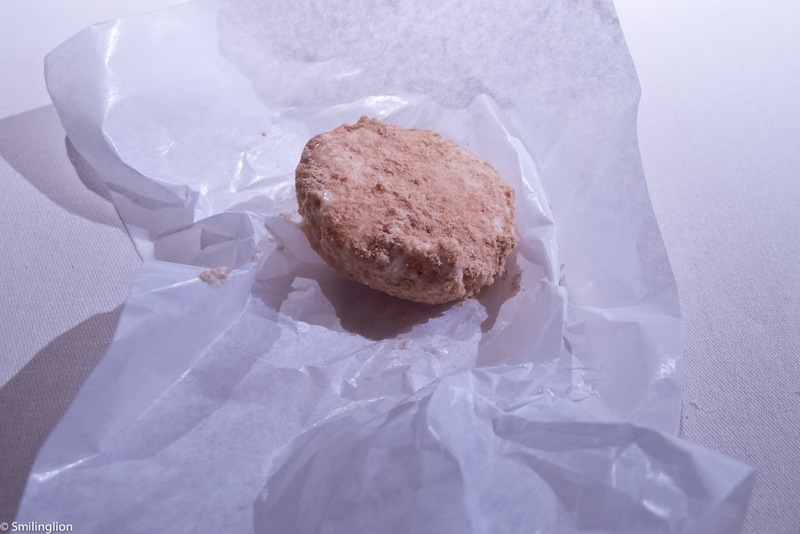 "Traditional" almond fairy cake: This was delightful and reminded us of something we commonly find at home during Chinese New Year (even wrapped the same way in the paper). "Forgotten memory from childhood." 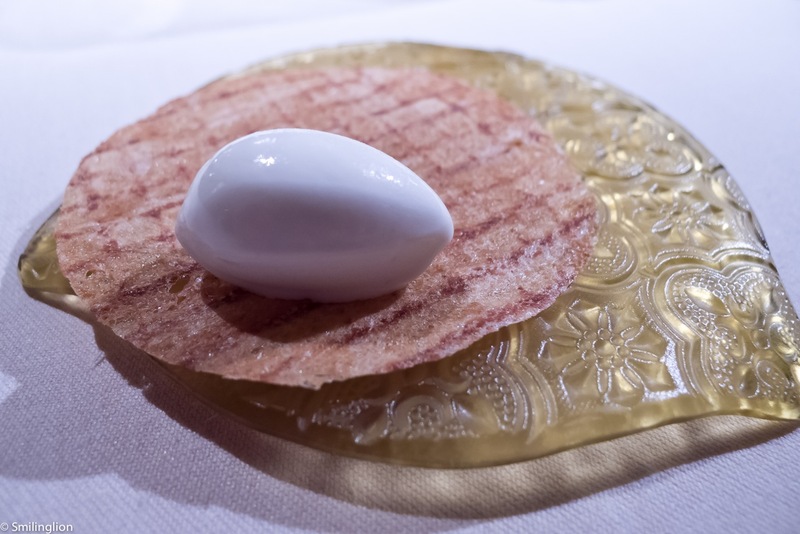 Small bite of milky wafer with lemon ice cream: Ice cream on a wafer was truly reminiscent of the days of our youth. Native cocoa and salted Mexican pepper mint: This after-dinner mint was done literally; a disc of chocolate with a mint leaf pressed over it. 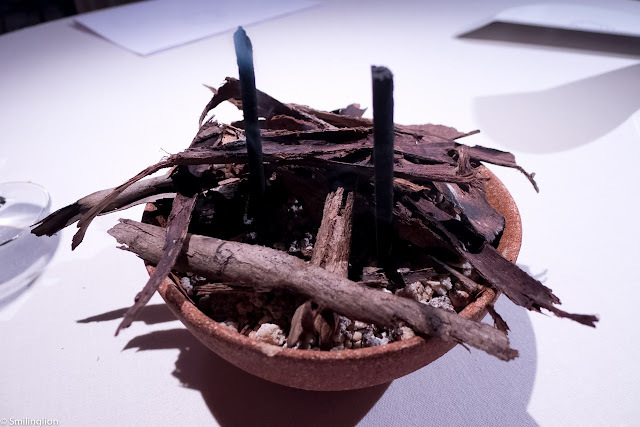 Candies of frankincense. 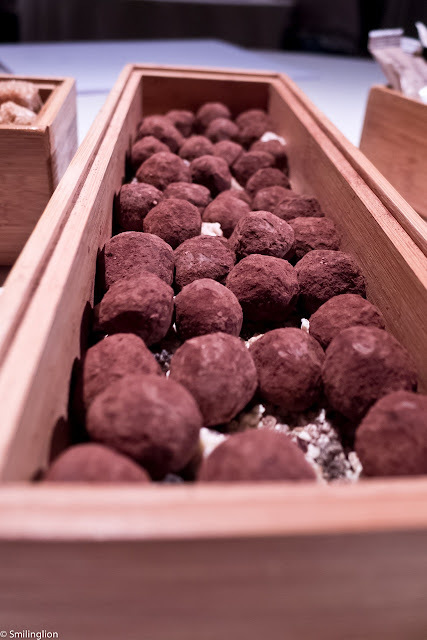 The perfume of eucalyptus barks: The petit four of candy and chocolate truffles was enjoyed amidst a swirling mist of frankincense, which together with the herbal tea worked wonders for our digestion after such a huge meal. Final Thoughts: During our meal there, Mugaritz didn't do 'molecular gastronomy' in that there was no use of foams, mists or other derivative cooking techniques, but what made our meal unique was the creation of dishes (often with conventional cooking methods) with ingredients paired to evoke a unique feeling for the diner, whether it be taste, texture, sound or smell. 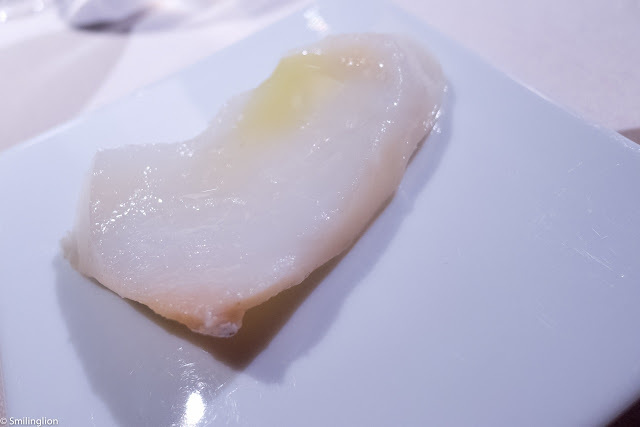 Despite a shaky start with a few entrees which didn't work for us, meal really took off halfway through (from the squid dish) and the main courses and desserts were superb. There was no a la carte menu and every guest had to go through the 20 course menu (with preferences and allergies reported to the kitchen at the time of making the reservation), so this was no restaurant for a casual meal. 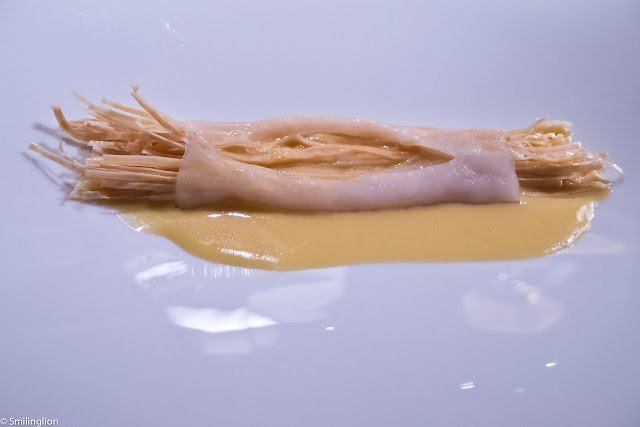 Moreover, we found that to make the best of our experience here, in addition to being very hungry, we also needed to be open-minded enough to leave our pre-conceived ideas of fine dining at the door and immerse ourselves in the culinary adventure prepared for us by Chef Aduriz and his team. 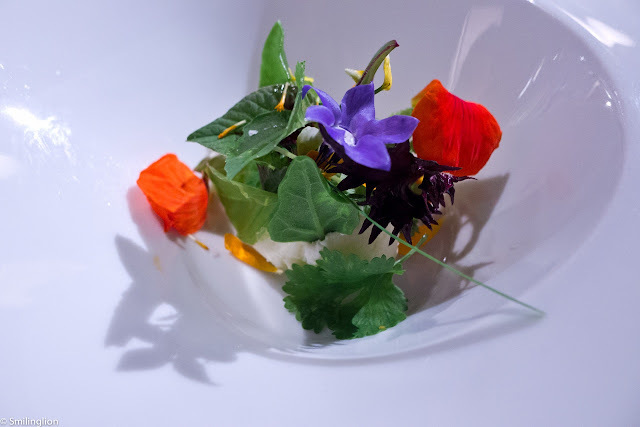 In that respect, Mugaritz managed to wow us with impressive food, attentive and seamless service, spectacular wine pairing and above all, wonderful entertainment.